As a disclaimer, I'm from a computer science / statistics background, working on some bioinformatics problems. I've got some genotyping data (VCF from Exome Sequencing), and I'm struggling to get my head around the Genotyping notation. As far as I understand, at a single base in the human genome, there can be two possible alleles, which would make sense given the standard notation for a lot of software is AA, AB, BB. So that means there are three possibilities homozygous, heterozygous, or homozygous respectively. The A or B alleles are derived from the paternal and maternal copies of the same base in a person's genome. The major allele is the one that occurs most frequently, and the minor occurs the least. When it comes to guessing which base is A and which is B, is there a general consensus as to which is which? i.e. is A the major allele? I'm just not sure my assumptions are right, it's been a while since I've studied any biology, and I've found that online resources are either too vague or are so complex, that they overlook these basics. Refer to the following image. What you want to note is that this is a mitotic chromosome. 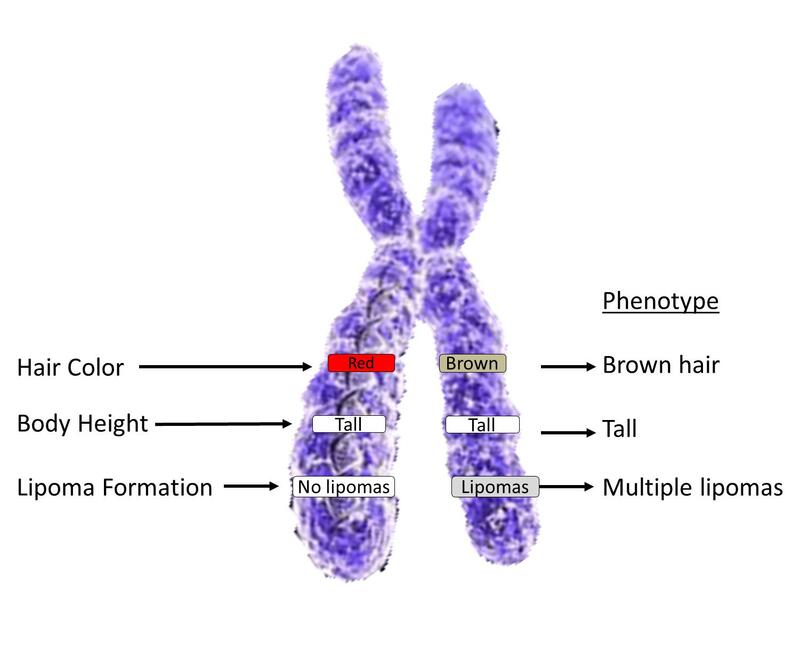 Your cells are generally diploid, meaning for humans where n=23 your somatic cells have 46 chromosomes that form 23 homologous chromosome pairs. In summary, the gene locus is for hair color, but there are red and brown alleles, or variations in a given gene locus for a given trait (see gene mapping). Thinking about traits and how they translate to features is complex in humans however due to features of our genomes such as epigenetics, epistasis, pleiotropy, etc. So when we describe in genetics traits such as color and how those related to AA, Aa or aa and so forth, it's nice to look at a much more simple organism like the pea plant that Mendel studied. By definition, the terms dominant and recessive refer to the genotypic interaction of alleles in producing the phenotype of the heterozygote. The key concept is genetic: Which of the two alleles present in the heterozygote is expressed, such that the organism is phenotypically identical to one of the two homozygotes. It is sometimes convenient to talk about the trait corresponding to the dominant allele as the dominant trait, and the trait corresponding to the hidden allele as the recessive trait. However, this can easily lead to confusion in understanding the concept as phenotypic. For example, to say that "green peas" dominate "yellow peas" confuses inherited genotypes and expressed phenotypes, and will subsequently confuse discussion of the molecular basis of the phenotypic difference. What you should also note is that dominance isn't intrinsic to the allele. Just because it's dominant to another allele doesn't mean it can't be co-dominant with another, and so forth. It also has no bearing on the population distribution of alleles, as certain dominant or recessive alleles can be either exceedingly rare or excessively common. That's likely going to depend on the population you are talking about. An allele might be more common the general population, but rare in an ethnic sub-group. If you have the vcf, you can probably go with the ref allele being the "major" allele. Are you sure that it really matters for your analysis which allele is more common in the population? Not the answer you're looking for? Browse other questions tagged genetics human-genetics sequence-analysis or ask your own question.